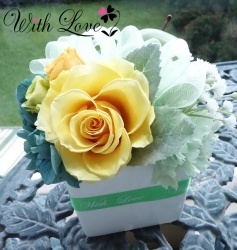 The 1-Day Trial lesson is for students with no prior experience in arranging preserved flowers. It provides students with an opportunity to see displayed arrangements and experience With Love's arrangment style. * Students with no prior preserved flower arranging experience can also start with the Basic Course, without taking a Trial Lesson. All tools will be prepared by With Love.